China is a large country with many regions and a long history. The history and culture are very different from what we are used to in Europe. To trade and work in China needs a lot of understanding and experience. In 1998 DO-IT started a partnership with Huaen, and today DO-IT imports many organic products from China. Huaen is a Chinese company established in 1994. The HUAEN project includes five organic working companies. Approximately 800 farmers are employed in each company. The farming region is in the northeastern part of China were agriculture is the main way of life. A big delta provides ideal irrigation possibilities. Because it serves as a water-winning area for the capital Beijing, the use of pesticides has been strongly restricted and extensive areas have been assigned to organic agriculture, surrounded by large buffer zones. The traditional handwork and simple methods are combined with advanced pest control. Nowadays the project is well developed according to European standards. There is recycled compost from livestock waste and crop surplus. Organic farms have developed natural methods for pest control such as “Red Eye Bees”, and each field has a sign to designate organic and a field number. Ecocert regularly checks and controls the fields and the farms. Several times a year Poppe Braam from DO-IT visits the farms and he has built a steady relationship with the Chinese farmers. In 1998 a cleaning plant was established in Dalian to complete the product cycle. The HUAEN project is developed with a long-term view. The slow development, the experience of the people involved and the understanding of each other’s culture and needs have resulted in an organic project with guaranteed organic produce and respect for humanity and nature. 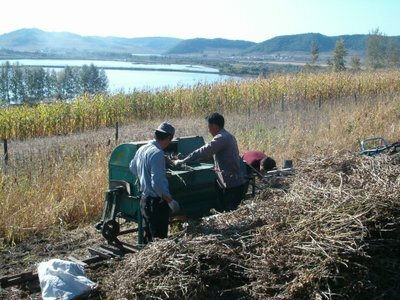 In 2007 DO-IT and HUAEN started to work with EcoSocial certification. A secondary school is financed and roads are built. Working, communication and transport conditions are improved. The guarantee for 100% well-certified organic produce is the principal goal, together with the welfare of the farmers and their families. DO-IT visits the farmers on a regular basis and the next generations are getting in charge of the farming. They are proud and glad with the personal contacts.